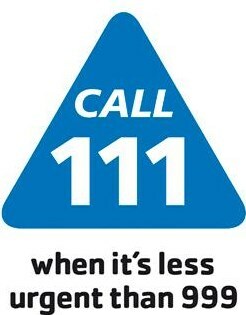 To contact the emergency ‘Out –of-hours’ doctor please phone 111. You will receive a telephone consultation. A home visit will be arranged if necessary. You may be asked to attend a treatment centre (normally Derriford Hospital). You may receive advice or see a doctor from another surgery. The ‘Out of Hours’ service is for URGENT MEDICAL PROBLEMS ONLY. Other problems should wait until normal surgery hours when patient records are available. All advice, medication or other treatment given by the emergency doctor will be notified to us in due course so that your records can be updated accordingly. An emergency department is located at Derriford Hospital and is open 24hrs a day, 7 days a week for anyone seeking healthcare for an urgent medical problem related to an accident or illness. It is a walk-in service so you do not need an appointment. The emergency department can be very busy and should be used by those patients seeking emergency medical attention. It should not be used instead of your GP, as many more minor or older problems are better treated by your own doctor. If you need help to get someone to hospital in an emergency, telephone 999 and ask for an ambulance. Follow any instructions the ambulance service call handler may give you. The Minor Injury Unit is open to anybody, no matter where they live. It is open everyday of the year from 8.30am to 9pm - including all bank holidays. An X-ray machine is available when required.